ACT FAST, it's all over in 3 days. Model 3 for $40, after 20% off. A little stiffer than a B17, but looks great and my fat a$$ can't tell the difference. 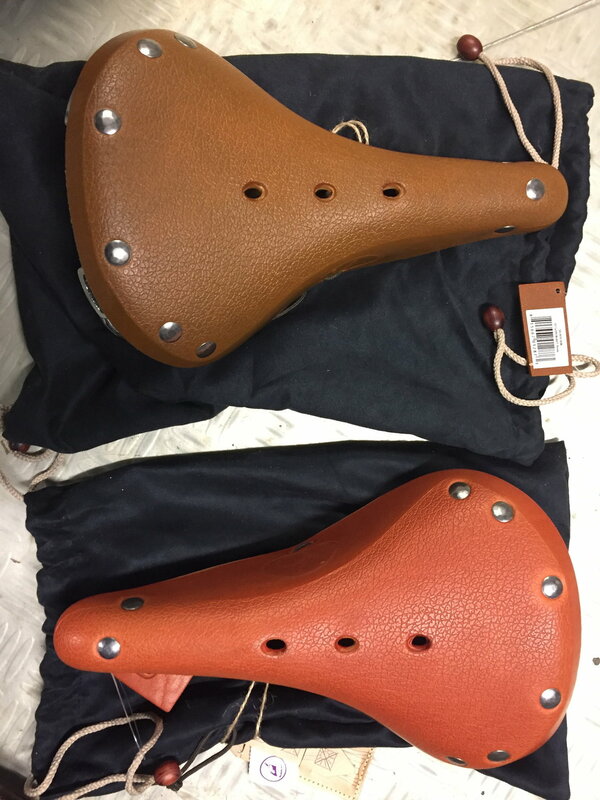 Hey, OJ: since you've bought these VO saddles before (I'm assuming) can you tell me whether they are a full-leather top or a laminated leather/fabric/naugahyde/whatever. What's your take on how well they hold up and retain their structural integrity over time? @lascauxcaveman, The top is all leather, with a thin bonded fabric underside, I had a VO model 3 on a Trek Hybrid that had many miles on it. Saddle held up very well during the 4 years or so on that bike, since sold. I guess I should stop stock piling saddles, lol. In looking for the above VO, I already have 8 Brooks leather, 2 Cambium, 2 Ideale, a White Sella Rolls, and 3 VO, all new or nearly new. But $40 is too good a deal to pass. One thing I like about the VO saddle is that the rails are slightly longer which allows you to move the saddle back more than you can a Brooks. Yep, except I have the Gyes version of them. I think they are all made by the same folks. I've had no issues with mine holding up. You said it!... The rails on my Brooks Pro Ti has pretty much zero fore and aft adjustability as the straight portion of the rails are so short. Just lucky that where it's at on my bike's seatpost, happens to work for me ergonomically..... but what's with Brooks, the great grand daddy of leather saddle makers, not providing enough straight rails on the Ti railed Pros??? I got myself a Model 6 as well, I've always been so curious about trying one of the more "racy" leather saddles, but always balked at the price. Picked up another Model 3 as well, I've grown to be very happy with the one I've had for about a year. Given the quality I've seen from every VO component I've purchased, it's pretty hard to beat two leather saddles for $110 shipped to my door! I guess that VO is living up to its name, VERY ORANGE. Hopefully they will do the exchange and not nick me for shipping for 2 Honey saddles. The one on top is a Model 5 Honey bought several years ago. I tried a Gyes (Taiwan maker of VOs) and thought it fine but perhaps did not wear as well a the Brooks and Ideale saddles I have had. 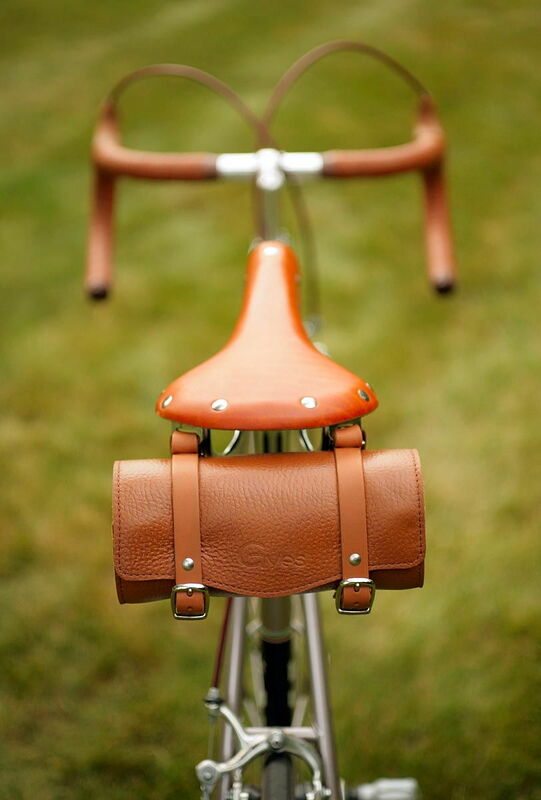 The below is a Zimbale, maker of leather and textile cycling bags. I picked up in South Australia, Australian leather with Korean manufacturing and can remember it was a much better price than Brooks. Been a great saddle, but only around 1,000 miles at most. Never seen these in the US. Oh wow @oddjob2 that is very, very orange! Just an FYI for anyone who is still interested in picking up some of these, Velo Orange posted on their blog today that they will not be selling the leather Model 3 anymore after current stock is sold out. I assume that applies to their Model 6 as well, since it's also at a deep discount. I received my Model 3 and Model 6 in brown on Tuesday. I haven't had a chance to mount them on anything yet, but I'm planning on throwing the Model 6 on my Trek 716 and seeing how it feels this weekend. Color is the same as my Model 3 that I've had for about a year. I also just bought the honey model (after seeing this thread), and I was also quite surprised at just how orange it was. I think I'll be able to find a use for it, but I'm definitely hoping in fades with age. Brown model 3 showed up over the weekend. Absolutely beautiful saddle and brightwork. Unfortunately it feels as hard as a coconut, so likely a non-starter. The nutcracker theme is stuck in my head now... must be the time of year. Flex, or maybe too much. A short straight region makes the stiffness by form a wee bit easier, that is my thinking. Having ridden a ti railed Flite, the frame I felt was much more limber than the steel version. I have a charcoal black 1985 Peugeot PGN10 with rainbow decals. The orange saddle will look hot on that bike. My model 5 broke in fine after a year of riding. It's all the Brooks in general. For me this means they do not work unless fitted to a bike with a lax seat tube angle. I would love have a B17 on my roadie Univega but makes my hands hurt, so I pedal with a modern erogo-matic saddle. 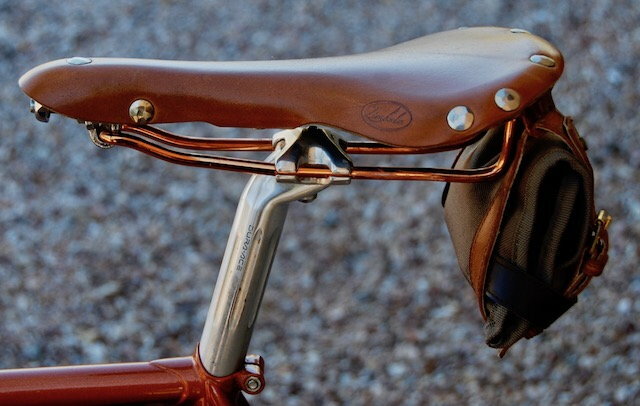 I think Brooks would gain a lot of popularity if they redesigned their saddle rails.